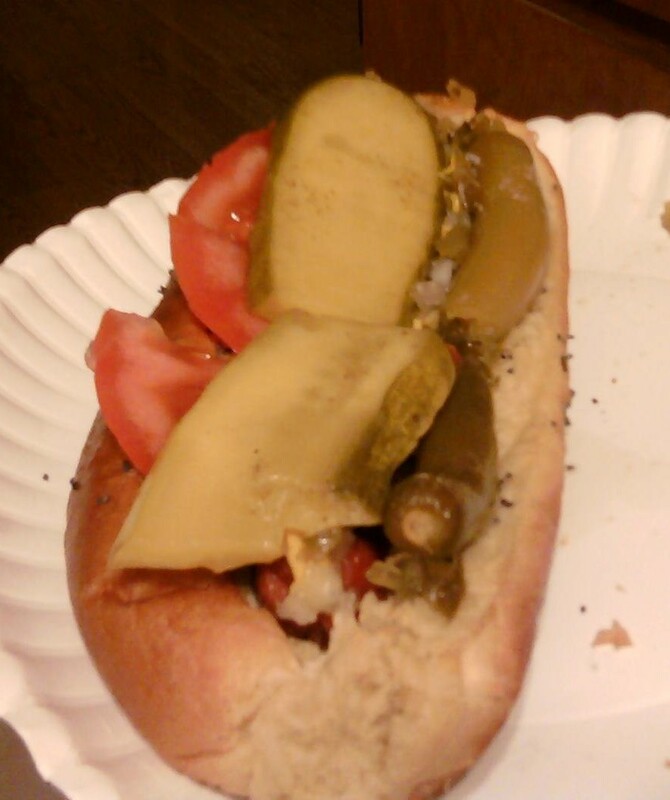 This is the closest we could get to a Chicago-style hot dog. The relish is just basic sweet relish, the peppers are serrano instead of "sport" and we had to make up our own poppyseed bun. We tried the recently released Sonic gourmet hot dogs and were impressed by the different flavors. I recently gave John the option of choosing what “special” food item we had for the weekend and what he wanted to do as a couple. We often choose an experimental food activity because it gives us something fun and creative to do together … then we can eat the project! For those are thinking “just tell us how to do it already!,” I’ll share the recipe…then you get the Jamie version of what we did to make it our own style due to lack of available ingredients! Lay the hot dog in the open bun (you’ll need to open up the bun a little bit, it’s about to get lots of stuff in it). Gently squirt the yellow mustard directly on the dog, or along the side of it. Place a decent portion of the green relish along the length of the dog. Sprinkle fresh diced onions over the relish. Place tomato wedges (we used slices, which is supposedly wrong…shhh!) along the hot dog, in the crevice between the meat and bun on one side. Place sport peppers in a single line along the other side of the tomato wedges. Top it off with the pickle spear. Sprinkle a dash (or you know, a smidge) of celery salt (not celery seed). OK, so now that that’s out of the way, here’s the Jamie version of what happened and what we did. That’s why I call this “Arkie style” because we had to come up with our own version a tad bit. We went to Harp’s because sometimes they are better about having weird ingredients than Walmart. We still didn’t find all that we needed! Just a warning: this will be filled with many mini-processes. I will try to make them easier to read by using bullets. Use a pastry or small grilling brush to brush the butter/seed mix along the sides of the buns. We couldn’t figure out the difference between regular sweet relish and the bright green sweet relish (one site even suggested we make it bright green by adding food coloring) so we just bought the regular stuff. Same thing with pickles… we just bought regular, kosher dill pickles. We ended up spending about two hours in the store between searching the Internet on my phone, asking for suggestions and simply finding everything we needed (we aren’t total freaks, we also spent time buying our other groceries). It’s hard to determine just how much we spent per hot dog because I added all the ingredients we bought for both the Chicago and New York style dogs and just divided by the number of hot dogs. 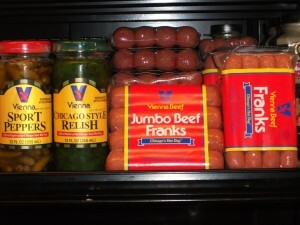 But we didn’t use any of the stuff that was unique for the New York style dogs because we didn’t make them, plus some of the items are stuff you would have to keep around because you can’t get it in small enough quantities for just one pack of hot dogs. All that said, we figured it was about $1.81 per dog. That beats Sonic’s $1.99. Depending on how you look at it, that’s either close enough to just pay someone else to get you your Chicago fix, or it’s a great way to save money and have a fun family activity. I’m not sad or annoyed that we spent all that time trying to figure out alternatives, though. It was a fun way to spend a Saturday evening together!